Printed pinecone Micro Flannel® heated electric blankets combine the style of a soft and neutral green and brown pattern with the cozy, warm delight of soft quilting. 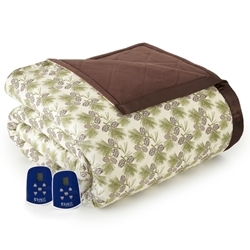 Show off your personality and style with our luxurious printed pinecone Micro Flannel® heated electric blanket. Our soft, durable blanket features a unique, gentle pattern that offers superior warmth thanks to our patented 7 Layers of Warmth™, featuring Micro Flannel®, down alternative fill, specially-crafted electrical cloth, and a quilted layer of heating elements. It works so well, you’ll want to keep one of our heated electric blankets on-hand to stay warm all year long – and you’ll love that it’s machine washable, bulk-free, lightweight, and breathable.